Living… in an empty apartment. It’s a desolate place that Nick only uses for sleeping. Profession… middle-management executive. His boss, Harkin, said that if he wants a promotion to Senior VP of Sales, he's got to earn it. So Nick has been killing himself for it. Nick comes in early, stays late, does extra work, and then his boss takes credit for everything that Nick does. Nick has always loathed his boss, but his hatred reaches murderous levels when Harkin gives the Senior VP of Sales position to himself. Interests… sleeping between 1 and 5 a.m. Otherwise, he is at work. He doesn’t even have time for his family. His parents are still upset at him for staying at work instead of saying goodbye to Gam Gam, his grandmother who recently passed away. In the rare moments when he’s not sleeping or working, he’s complaining with his childhood friends Dale Arbus and Kurt Buckman. Relationship status… single. He had a great time with Jenna on their last date, but she won't go out with him again – not that Nick has the time. Challenge… killing his heartless boss. 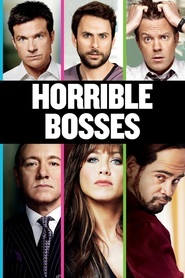 After countless nights spent complaining about their horrible employers, Nick and his friends finally agree that their lives would be much easier if “their bosses weren’t around.” Unsure of how to pull off the crime, they head to the rough side of town where they meet “Motherf-cker Jones,” a recently paroled criminal who agrees to be their murder consultant. The bumbling trio then sets about trying to murder each other’s bosses, a situation that predictably spirals out of control. Personality… rational, straight-laced, and sarcastic. Nick is the most serious of his friends, and often brings the group back to reality when they start to get off track. He’s obedient by nature and doesn’t have much experience breaking the rules, which makes committing a murder pretty difficult for him. Nick Hendricks's popularity ranking on CharacTour is #3179 out of 5,000+ characters. See our top-ranked characters and read their profiles.